18 months & up. 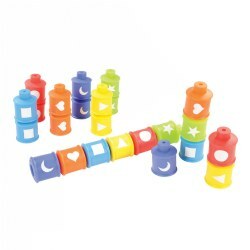 This elegant set of BeginAgain "first blocks" teaches numbers, counting, colors, grabbing, and stacking. 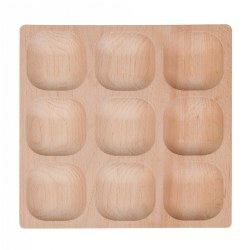 Made from sustainably harvested rubber wood, each of the ten, 1 1/4" square blocks are numbered on one side. Each block is stained a different color with a non-toxic, child safe stains. Easy clean up and display with the rectangular storage box. 12 months & up. 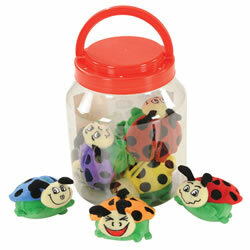 A jar full of ladybugs that crinkle, have textures, and hook together with magnets. Introduce math as children learn to count the dots on the ladybug's wings. Each ladybug is 3 1/2" long. 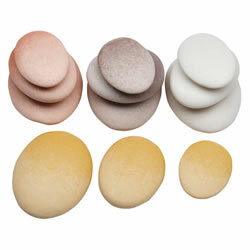 Surface wash. Set of 8. 24 months & up. 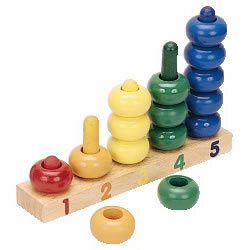 Colored-coded numbers on base help child successfully place rings. 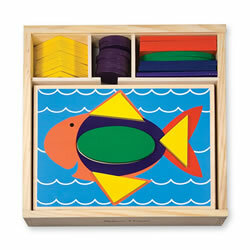 Teaches color, shape and number matching. You can count on the rugged wood to last for years. 2 years & up. 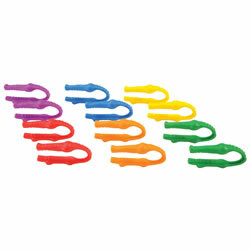 This set of six Tongs are great for developing and refining fine motor skills. Children will learn how to control their hand muscles while they grasp, hold, move, and release items. Tongs are 6" long. 2 years & up. Fun alligator themed tweezers sized right for toddlers. 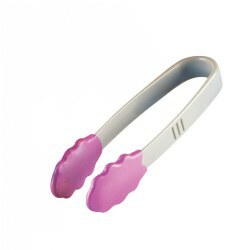 The easier tension and smaller size will make it easy for toddler to use. 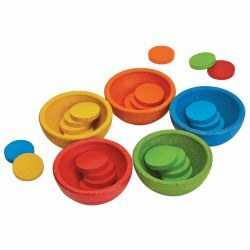 Great for developing fine motor skills, games, and sorting activities. 4" long. Set of 12 in 6 colors. 2 years & up. A delicious way to recognize, order and count numbers from 1-10. 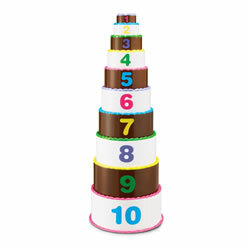 Ten stackable layers feature different color frosting, plastic layers wipe clean and nest for easy storage. Cake measures 22"H when stacked. 2 years & up. 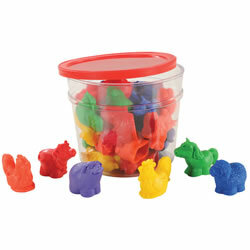 Fun animal shapes in six different colors are sized just right for little hands to hold, count and sort. 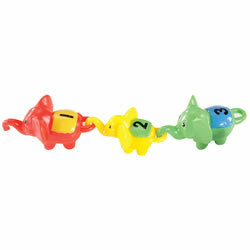 They can double as a finger puppet to extend the learning. 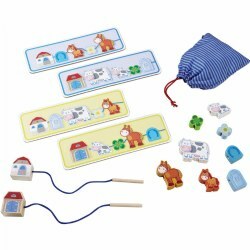 Includes 6 each of 5 animals: cow, horse, rooster, pig and sheep. Activity guide. 2 1/4" each. 2 years & up. Made from FSC approved beech wood. The 9-sections arranged in a 3 x 3 array are perfect to help children sort according to particular criteria such as size, shape, number, color, or pattern. It is also useful for more open-ended investigations and perfect for collecting and displaying fascinating objects that the children discover. Contents shown are not included. 2 years & up. 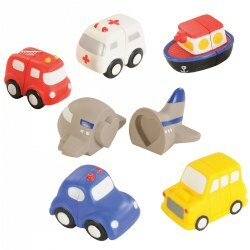 Encourage color and shape recognition while building fine motor skills. Match the correct bolt in size and color to the activity card and fasten with the nut. Activity cards vary in degree of difficulty to challenge children to a higher level of thinking. 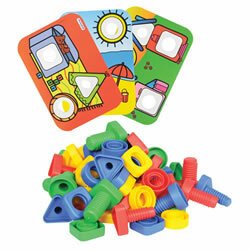 Includes 36 nuts and bolts in 3 sizes and 4 colors and 16 plastic activity cards. 2 years & up. Ten adorable elephants link together tail to trunk. Each blanket is color coded to match the one that comes next in the sequence. 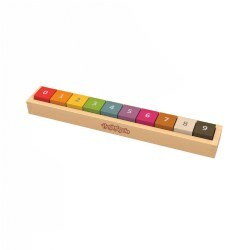 Reinforces number recognition, sequencing and color matching. 5 large and 5 small elephants. Large elephants measure 4 1/4"L x 2 1/4"H.
2 years & up. Chunky, snap-together pieces are easy for little hands to manage as they build adorable bug friends and fine motor skills. 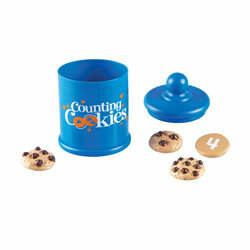 Introduce numbers, counting 0-5, addition and color matching. 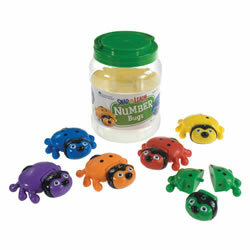 Each bug measures 4"L x 4"W x 1 1/2"H. Includes storage jar and 18 pieces to make 6 bugs. 2 years & up. 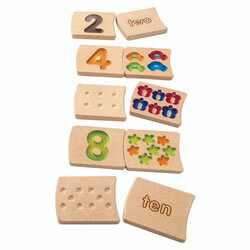 This 20-piece wooden tile set makes the introduction to numbers as easy as 1-2-3! 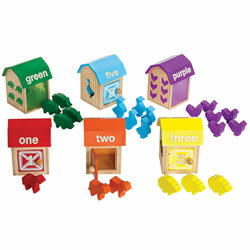 The two-sided tiles feature numbers 1-10, colorful pictures and words that help young children count, match, spell and trace the numbers. 2 years & up. 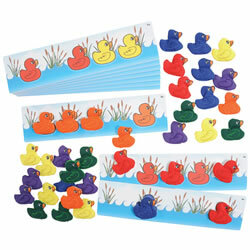 Sort the ducks by color or use with the pond themed cards for a simple patterning game. Includes 10 double sided cards and 24 fabric ducks. Cards wipe clean and ducks are machine washable. 2 years & up. This counting croc needs help! Gather all of his wooden pieces and count to ten to put him together in the right order. 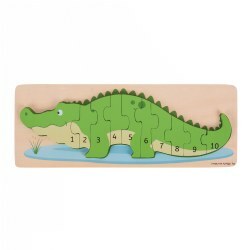 Wooden puzzle features 10 chunky pieces that make up an adorable crocodile and a fun wooden base board with printed images and colors. Each piece has a number on the front that matches to a corresponding quantity of dots on the base board. Puzzle size: 16"L x 6.5"H.
2 years & up. A twist on the classic nesting dolls. 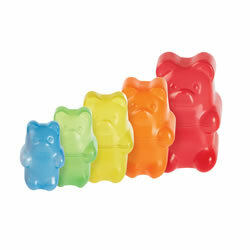 These five different sized gummy bears easily nest for a fun way to build size and color recognition and fine motor (nesting) skills. Largest bear measures 6 1/2" high.